Viewing topic "MIDI Port 3 Sysex"
The Model/Product ID for the MOXF is the fourth and fifth bytes, which would be “7F 1C”. There’s a MIDI Filter setting for “Exclusive” in the MOXF, but it should only affect messages embedded in sequences. See page 144 of the MOXF Reference Manual. I wonder if that “fix” might have “broken” something else. I noticed some strange behavior in my MoXF with OS V1.03 that might be of interest. The sysex dumps that come from the Motif XF via MIDI connected to the MoXF take over 3 times longer to arrive then via Motif XF USB. 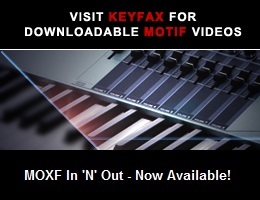 Note: The Motif XF is already 1.5 times faster via USB then the MoXF via USB. Because of this delay, it seems the sysex’s aren’t directly put through to port 3, but are being processed in the MoXF before being send to port 3. When I send sysex’s to port 1, 2, 3, 4, the MoXF accepts them and responds to them. So even the MIDI thru can be used to control my MoXF. The only port that it doesn’t accept messages from is port 5. It might be that the “fix” has caused this “MIDI thru problem” if they “fixed” it after filtering for MoXF/Motif XF messages (For both they start with “F0 43 00 7F"). If so. that would mean that both OS V1.10 and OS V1.12 should have this problem and only OS V1.03 doesn’t. Yes, I mentioned this possibility in my previous post. I encourage Davelet to contact Yamaha Support and make them aware of his findings. Since the MOXF is still in production, Yamaha should investigate, and if the problem is verified it should be fixed in an OS update. I only saw your message right after I sent mine, otherwise I would have changed it a bit. I agree, that’s the best way to go. As for me, I’m glad I never updated my MoXF, and I most likely never will, unless there’s a way to downgrade it again. I’ve had a lovely evening making music and not battling with MOXF sysex and feel refreshed. When I have got my patience back with it, I’ll look at the MIDI filter thing in the song/pattern utility mode and see if changing that changes anything. If not I’ll contact Yamaha support in due course. I’ll let you know either way. The thread you sent over 5pinDIN was interesting - interesting that someone was having and identical problem but with the Tyros 3 keyboard. An update on this. I did contact Yamaha Support as 5pinDIN suggested and after a bit of back-and-forth with them to understand my problem I sent them two SYSEX files that were not being transmitted completely and correctly from the MIDI port of my MOXF (via “Port 3” from the computer - as I described in my original post). The support engineer could recreate exactly my problem with the files that I sent her, and has escalated the problem to Yamaha HQ. So, it would turn out that I wasn’t doing something wrong after all (phew), and nor would it appear to be only my MOXF (2nd phew). Out of interest, the two files I sent her were a DX7II dump, and an FS1R FSEQ. So both Yamaha SYSEX data, but neither were transmitted in their entirety from my MOXF. I’ll keep you updated if and when I hear back. It’s good that Yamaha was able to duplicate the problem. It will be interesting to see if they do anything about it.